As part of a data center refurbishment, the J.R. Simplot IT department wanted to increase rack density, be better able to troubleshoot IT equipment and put in systems to manage potential risks. Also, going green has become a significant corporate initiative for J.R. Simplot which now has a dedicated environmental staff who monitor the company’s use of power weekly. As a result, the data center staff wanted to use electrical power more efficiently. -Transition from 120 to 240 volts AC for greater power efficiency and to provide more power to the racks. -Increase rack density by matching the power capacity at a rack to the number of devices. -Match access and control tools like KVM ports and devices. In summary, optimize and drive efficiency at all levels of utilization and access. J.R. Simplot data center management identified several features they wanted in their data center: Outlet-level power metering and switching, environmental monitoring, user management, thresholds and alerts, energy management software and a suitable rack PDU form factor. Power metering needed to be available for both the rack PDU and the individual PDU outlets. A Web browser GUI to provide easy, available-anywhere monitoring and control was key. Compatibility with energy management software was important as was real-world accuracy, especially for power consumption (kwh). Outlet switching was required for remote control and load shedding, shutting down non-critical devices, was important in the event of a power failure. Outlet switching was also to be used in conjunction with LDAP and Active Directory® for user management and to provision power. Easily deployed environmental monitoring sensors for temperature and humidity were a requirement. Critical and non-critical thresholds and alerts for both power and environmental conditions needed to be supported. The energy management software should gather power and environmental data over time, analyze the data and be flexible enough to create user-defined reports for J.R. Simplot’s environmental staff. Finally, the data center staff wanted Zero U PDUs because they don’t take up rack unit space and allow for shorter cabling and cleaner cable routing. They also promote better air flow. Since Zero U PDUs can make it difficult to install equipment at the rear of the rack, low profile PDUs with flexible yet secure rack mounting options were specified. One of the objectives of the data center project was to improve energy efficiency. The approach chosen was to convert from 120 to 240 volt AC single-phase power. Typically, servers have universal power supplies and are rated to handle a range of voltages from 100 to 240 volts without significant modification. Providing higher voltages to IT equipment racks is more efficient than lower voltages because the resistance and transmission losses are less. Also, a higher voltage can deliver more apparent power. The J.R. Simplot data center converted from four 15A, 120V PDUs per rack to two 30A, 240V PDUs per rack and doubled the available power. Another objective was to provide accurate, detailed and granular power information at the rack. Specifically, outlet- level power monitoring, not just PDU-level power monitoring, was a requirement for two main reasons. The first reason was capacity management. In the past, equipment would be brought into the data center and installed without prior testing to determine the power draw and without sufficient attention paid to the power capacity of the rack. As a result, racks of IT equipment were brought down due to “rogue” equipment installations. By adding intelligent rack PDUs with outlet-level power information the data center staff can now test equipment and know what power will be drawn by individual IT devices. By gathering the power draw data over time, reports can be created to determine peak loads. This is very useful information to have prior to a migration, consolidation or installation. Judgments can now be made in advance about what equipment should be located where and what devices may need to be moved to maintain sufficient power headroom. “Rogue” equipment installations have been stopped with user management supported by LDAP and Active Directory®. Now, outlets available for new equipment are switched on when the data center is ready to provision them. Detailed troubleshooting was the second reason for outlet- level power monitoring. The data center team had some servers that routinely ran into problems, but it was difficult to isolate the causal factors. They wanted to determine if there was a relationship between the failures and power. 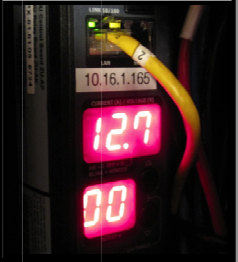 The outlet-level power monitoring allows the data center staff to identify machines causing load spikes. It is used during new equipment evaluations to compare and validate vendor efficiency claims. And it supports the identification of inefficient servers which are now candidates for decommissioning. The power utilization of tasks such as backup and database applications can also be assessed. Quick and easy access to environmental data was a big plus. Raritan sensors simply plug into the Dominion® PX rack PDU, use the PDU’s Ethernet connection and the environmental data is displayed in the same Web-based GUI as the power information. Critical and non-critical thresholds and alerts for both power and environmental conditions are provided using SNMP v2 and v3. These alerts are important as the data center’s ambient temperature is increased to reduce cooling costs and to be consistent with the latest ASHRAE guidelines. The Raritan Power IQTM energy management software, a VMware Certified virtual appliance, is used by the data center to bulk configure the rack PDUs. It is also used to gather power and environmental data over time, analyze the data and create reports. The reports, which can be organized by department, equipment type or location, are regularly provided to J.R. Simplot’s dedicated environmental staff and show that the data center team is doing its part to support the corporate initiative. J.R. Simplot is one of the largest privately held food and agribusiness companies in the U.S. Improving energy efficiency to meet corporate green initiatives. Increase rack density by matching power capacity to number of devices. More efficient troubleshooting and systems to manage risks. Intelligent rack PDUs with outlet-level power metering. Power IQ energy management software. Dominion KSX KVM-over-IP and environmental monitoring sensors. Intelligent rack PDUs with outlet-level power metering allows staff to use full rack capacity. Outlet-level metering allows the team to faulty or inefficient machines for decommissioning. Environmental monitoring sensors and software provide alerts and ensure guidelines are being met.